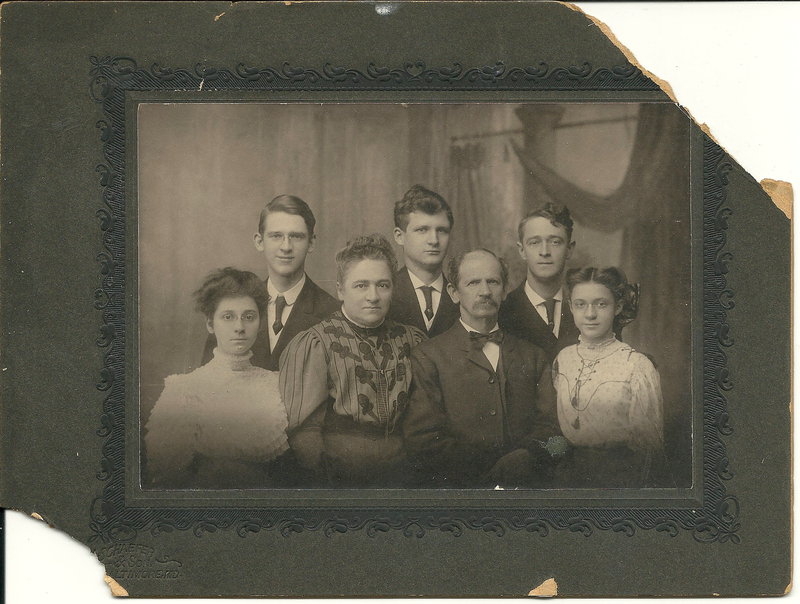 People who research family history take different stances regarding the buying and selling of orphaned family photographs. Some refuse to buy them on principle; some take even more militant stances, engaging in small acts of illicit resistance. You can condemn these sales as unseemly, but the reality is that without the trade in vintage photographs, most orphaned family photos would end up in the trash after more valued possessions are sold in estate sales. So, I rescue what I can afford to, make family trees for the families on ancestry.com, and post the photos to the trees and to other sites like findagrave.com. At least this way, family structures are preserved on the web, and descendants have some chance of discovering their ancestors’ images. Ultimately, most of what I collect will go to archives and historical groups in Maryland. This month, I dug into my frayed pockets to rescue an identified collection of about 20 vintage photographs from the early 1900s. All the individuals lived in Baltimore and Catonsville, Maryland, and are related to German immigrant John G. Schwartz (1847-1924) and his wife Anna H. Schlerf (b. abt. 1858, Baltimore, Md.). Surnames of identifications inked on these photos, in addition to Schwartz, are Apy, Lemmerman, Schlerf, and Houff. Baltimore studios represented include J. H. Schaefer (John Henry Schaefer), Ernst Rudolph, Perkins (Harry Lenfield Perkins), and Russell (Mrs. Dora C. Russell). Seated, center: John G. Schwartz and his wife Anna C. Schlerf; to their right, Edna F. M. Schwartz (1893-1975); to their left, Anna D. Schwartz (1880-1963). Standing, left to right, are John and Anna’s three sons: George H. Schwartz (1886-1968) Walter H. Schwartz (1883-1965), and John F. Schwartz (b. abt. 1881). Here is what I’ve been able to learn about John G. Schwartz. In 1900, he identified himself as a grocer, and the census-taker recorded his year of immigration as 1856. The family lived on North Schroeder Street. Sometime between 1900 and 1910, the family moved to 520 N. Fulton Avenue, an area of three story, two- and three-bay Italianate row houses. According to his Baltimore SUN obituary, John G. Schwartz “for the last 50 years conducted a stall in Lexington Market. He was one of the pioneers in its development.” He was said to have among his living relations a sister, Mrs. Caroline Mable, and a brother, Frederick Schwartz. John was a member of St. Paul’s “German Evangelical Lutheran Church,” and was buried in their cemetery in a neighborhood called Violetville. The Violetville St. Paul’s Cemetery is located at 1022 Joh Avenue in Baltimore, across from what is now Violetville United Methodist Church. It’s here that I believe he is buried. The graves of his two daughters, Anna Schwartz and Edna Schwartz, have already been located there by diligent volunteers. I am hopeful his and his wife’s graves will eventually be located nearby. The photographer, John H. Schaefer (1830-1921), was born in Hessen-Darmstadt, Germany, and belonged to the same church as the Schwartz family. He is buried in the older St. Paul’s Cemetery. This older St. Paul’s Cemetery is located adjacent to the grounds of Druid Hill Park. It’s also known as “Martini’s St. Paul’s Cemetery,” or “St. Paul’s Cemetery Druid Hill Park,” and has been the focus of substantial restoration efforts. The card mount on this photograph is blind embossed “J. H. Schaefer and Son,” so this must have been taken after Schaefer’s son, John William Schaefer, joined the business. The address, unfortunately, has been lost with the disintegration of the mount, but based on the appearance of the children, I’m guessing the family sat for this portrait around 1905. The Schwartz family is posed perfectly conventionally and perfectly harmoniously: elders at the center, flanked by their two daughters, and backed by their three grown sons. It’s a photograph that speaks of family success, both professional and personal. Only Walter’s slight scowl, echoing his father’s stern stare, hints at the emotional life beneath this perfect image of middle class respectability. What a wonderful job.. As historian of Martini Lutheran Church, i was able to share your website with one of Shlerf family. I have a pic of John and Anna’s grave at Violetville. I can email if you like. My wife’s mother’s maiden name was Schlerf. No issues here. You are not only preserving the photographs, you’re sharing your research about them with the public.